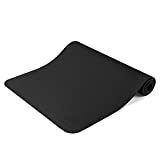 Details: 2.3 lbs, 68” x 24”, 5mm thick, grippy texture, lightweight, alignment stripe for proper positioning, closed-cell surface prevents sweat from seeping into the mat, eco-friendly manufacturing. Material: TPE. The quality and performance of Manduka mats and yoga accessories are still unmatched in the marketplace. They are still crafted using simple, enduring, natural, and whenever possible, renewable materials and a fine attention to detail. Manduka is a company built by and for yoga teachers and their students. They are still evolving, still introducing new products, and still celebrating the spirit and wisdom of yoga teachers and their students. From the road less traveled, something great and meaningful has arrived.